With Christmas right around the corner, you could do a lot worse than to stuff a soccer fan’s stocking with Ian Plenderleith’s Rock and Roll Soccer: The Short Life and Fast Times of the North American Soccer League. The title tells you all you need to know about this breezy history of the original NASL, told by the men who played in it during that brief period when it appeared that soccer had finally arrived in the United States. For one team, though, “rock and roll soccer” was literal. Owned by a handful of rock stars and managers, the Philadelphia Fury were set to be one of the NASL’s bedrock franchises in the Great Expansion of 1978. And, on paper, the team should have been a great success in the City of Brotherly Love, which had fervently supported the league’s earlier Philadelphia franchise, the Philadelphia Atoms, a franchise that had helped jump-start the league just five years earlier. 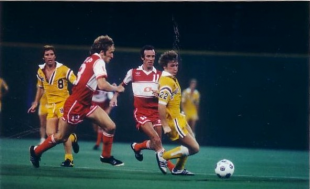 Ultimately, the Fury were a micro version of everything that the NASL would do wrong in the years leading up to its demise after the 1984 season. Not surprisingly, the Fury were not around to see the finish. Once the shining star of the North American Soccer League, the Philadelphia Atoms—champions of the league just three seasons earlier in their first year of existence—limped into the 1976 season. With original owner Tom McCloskey finding no takers when the club was for sale, the team was set to fold before the American bicentennial until the last minute arrival of a consortium of Mexican clubs kept the team alive. But this proto-Chivas USA (literally—Club Deportivo Guadalajara was part of the consortium) failed as dismally as the next attempt would 30 years later. The Mexican owners failed to make a required $150,000 performance bond after the 1976 season, and the team was again put on the block. On January 13, 1977, the NASL approved the sale and transfer of the franchise to San Antonio—an odd choice, as that city had just lost an NASL team to Hawaii a few weeks earlier. Ultimately, the announcement was premature—the sale fell through. Thus, as the 1977 season approached, the NASL placed the once-proud Philadelphia Atoms franchise into receivership. However, NASL Commissioner Phil Woosnam was still acutely aware of the Philadelphia’s potential as a soccer city, and was keen to expand back into the City of Brotherly Love. With the demise of the Atoms, Philadelphia was without professional soccer in 1977, Pelé’s final year with the New York Cosmos. The great player’s farewell tour had generated tremendous interest in the league circuit, and crowds of over 40,000 could be found in New York and Minnesota with some regularity. After the 1977 season, Woosnam decided the time was right to undertake a massive expansion, and announced that six new teams would be added for the 1978 season. 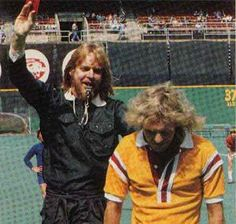 Rock and Roll soccer: Rick Wakeman and Peter Frampton at a Fury charity match. The Fury’s owners listed like a roster of Rock and Roll Hall of Fame candidates. Among the team’s investors were Rick Wakeman, influential keyboardist with the hugely successful rock group, Yes; Peter Frampton, at that time the biggest solo rock star in the world by virtue of his mega-platinum album, Frampton Comes Alive; and Paul Simon, the well-known New York singer-songwriter. (Although early reports included Mick Jagger as part of the ownership group, he in fact backed out of the deal on the advice of his advisors.) Other music industry big-wigs investing in the team were Frank Barsalona, manager of both Wakeman and Frampton; Dee Anthony, manager of Frampton and other major-league acts like Humble Pie; Peter Rudge, the Rolling Stones’ tour manager; Terry Ellis and Chris Wright, owners of Chrysalis Records; and Jerry Moss, co-owner of A&M Records. In keeping with this rock and roll background, the Fury proceeded to unveil one of the most attractive logos in all of sports history. A distinctive “soccer ball-entering-atmosphere” logo was introduced, and the maroon and yellow fireball was sure to be a licensing hit, long before anyone realized the potential for such things. Ultimately, what the Fury did as a soccer team was going to make or break its chances of success. Given the later blunders of the front office, it is just as likely that the Fury’s owners simply hired local people because it was the path of least resistance rather than directly attempt to tap into the residual goodwill still left behind by the Atoms. In any event, several former players and front office personnel wound up returning to Philadelphia and contributing to the new club. The first major Atoms connection could be found in the front office. Bob Ehlinger, the general manager during the Atoms 1973 championship season, returned to Philadelphia after serving three years as the NASL Deputy Commissioner. One of Ehlinger’s first signings was former Atoms captain Derek Trevis, who was available after an unsuccessful two-year stint as player-coach with the San Diego Jaws and Las Vegas Quicksilvers. Ehlinger’s goal was to build a team primarily of American players, if not all American, within three to five years, and to build it with mostly Philadelphia-area talent. As the Atoms had proved in 1973, this was a workable goal. In keeping with that aim, the Fury drafted Levittown, Pa. native and Penn State graduate Rich Reice with its first pick in the 1978 NASL Draft. The Fury also drafted Rancocas Valley High School and Mercer County College star Pat Fidelia in the supplemental draft. Finally, the Fury acquired several free agents with local ties, including Florian Kempf and goalkeeper Dave Bragg. Several ex-Atoms also found their way home. Along with Trevis, Bill Straub returned to help anchor the new team’s backline. Also joining the defensive corps was Brooks Cryder, the Atoms’ first-round draft pick in 1976 who had eschewed the Atoms for a season in the minor American Soccer League. Finally, goalkeeper Jim Miller, a native of Roxborough, returned to professional soccer with the Fury. By 1978, though, an NASL team could no longer get by with a smattering of local talent combined with a few journeymen English players, as the Atoms had. Experienced stars were now required. As a result, the Fury dug into its relatively deep pockets and signed a number of international superstars. The Fury’s first signing was Peter “The Wizard of Oz” Osgood, a prolific goalscorer who had been capped a number of times by the English national team. Joining Osgood was midfielder Alan Ball, a star of England’s 1966 World Cup champions. Another star was Johnny Giles, long-time Irish international star renowned for his tenure with Leeds United. George Armstrong of Arsenal was also announced as a signing, but the diminutive forward never reported to the club; as he did the same thing to the Minnesota Kicks in 1977, the Fury were not especially surprised. 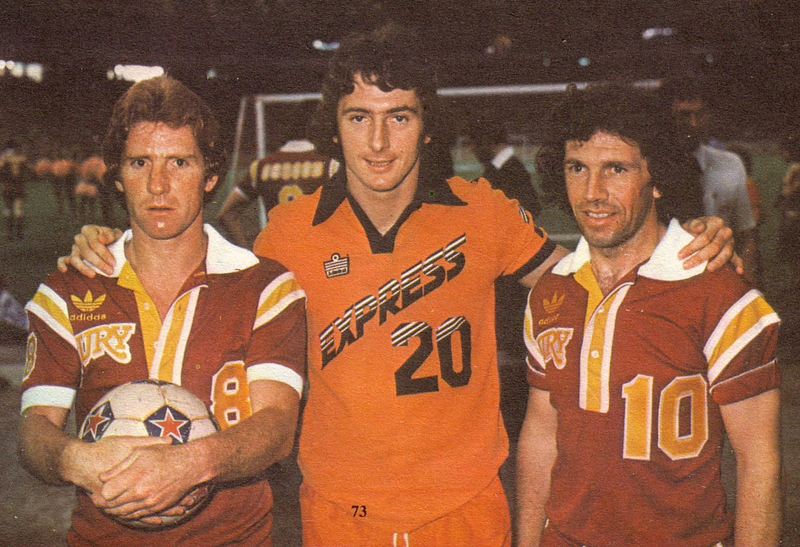 Alan Ball (L), and Johnny Giles (R), with Detroit Express forward Trevor Francis. Photocourtesy of NASLjerseys.com. Rounding out the roster were a number of lesser signings: goalkeeper Keith MacRae, midfielder Tony Glavin, defender John Dempsey, and a number of young Irishmen, including Fran O’Brien, Eddie Byrne, Pat Byrne, and Pierce O’Leary. To coach this motley assortment, the Fury tabbed a 37-year old Englishman named Richard Dinnis, fresh from coaching Newcastle to a respectable middle-of-the-table finish in the English First Division (now the Premier League)–but just as fresh from getting sacked from the job after only 5 months. Along with the wild logo, the Fury introduced another first: designer uniforms. .
“I wanted to give the uniforms a collegiate, All-American air,” said Sal J. Cesarani, the two-time Coty Award winner in the field of clothes design who was commissioned to design the Philadelphia kit. Instead of the “usual V-necked shirt thing,” the Fury shirt featured a deep three-button placket, a ribbed collar, and capped sleeves. Of a stretchy polyester and cotton blend, the shirt was designed as “trim fitting so it will stay down inside the shorts,” said Cesarani. The shorts themselves were tapered and two inches shorter than the usual shorts in use at the time, with the side vents five inches deep instead of the more typical two inches. Finally, the designer felt that, since the socks “were so apparent during the game, I wanted to do something with them.” What he did was sew a fishtail-like trim down the side of the high, sturdy cotton socks so that they appeared to be an extension of the trim on the shorts. There was a purpose to this: surveys at the time had shown that, unlike in Europe, where soccer was almost exclusively a spectator sport for males only, 45 percent of the American soccer audience was female. Were the Fury engaging in a pretty blatant case of pandering? Would this concern with non-soccer related issues be an ominous sign? Enjoyed the article, brought back memories of Ball and Giles competing against each other at Everton and Leeds in the days when players were nicknamed iron man, chopper, and gentlemaim Jim,both had a tenacious approach to the game when tackling was allowed. I’m sure they brought a bite to the same midfield. The born is the king banner seen today at Stamford bridge refers to Osgood.